The next Taizé Service is hosted by Bethany Lutheran, April 14th @ 4:00 p.m. 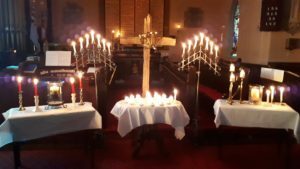 Imagine a service which involves the singing of praises and prayers, candles, lessons — and silence. This is Taizé. Our Taizé services take place on occasion only and are very special moments of prayer and meditation. All Christians and seekers of God’s peace are welcome to attend.